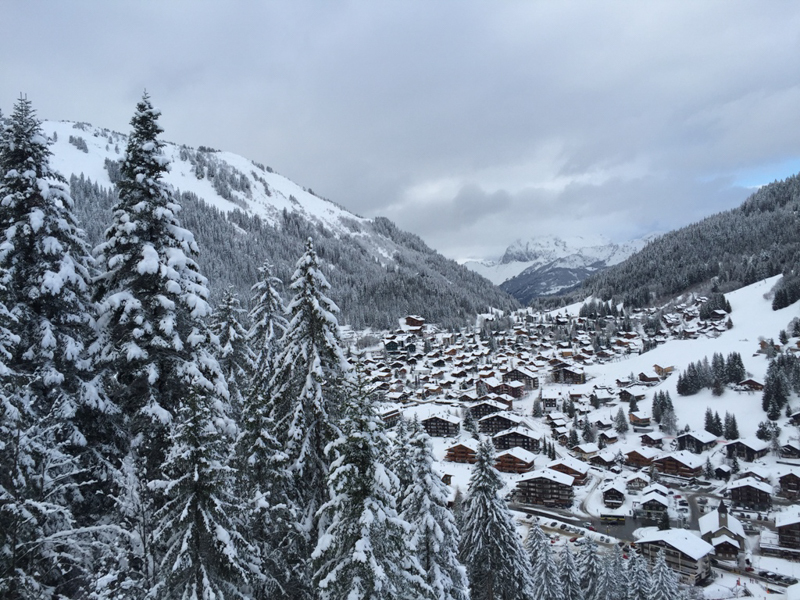 Snow and Switzerland go hand in hand—and here at Simple Family Travel we have your winter activities covered. Each week throughout the winter season you will hear from families who call Switzerland home and where they like to spend their winter days. You’ll discover the best way to get there, which skiing abilities the area caters to, where to rent skis, and which restaurants to try. And as the weeks go on, we won't forget the non-skiers either! You can check at the past destinations in the series "Swiss Family Skiing" here. Today we head to Morgins in the French part of Switzerland with mum of 2 and Pilates instructor, Sharon. Photo supplied by Bret Marshall of Morgins Snowsports through Sharon. Our young family of four first went to Morgins about 6 years ago (we had then a 2 year old and a 4 year old) and I must say, the ski school (M3S) combined with the wide slopes and the affordability keeps bringing us back to the French side of Switzerland year after year. Morgins is marketed as the Swiss resort of the international Portes du Soleil area. Only 90 min from Geneva, and approximately 2.5 hours from Zug, it is located on the border between France and Switzerland, in the Valais region. It is a long journey by public transport. From Montreux its just over an hour with 2 trains and a bus so the car is the best option if you have one. Morgins is apart of the Porte du Soleil region which means you have access to a total of 300 ski slopes (30 black, 110 red, 123 blue and 37 green) divided between 12 resorts. Snow boarders will also be happy with 21 snow parks and boarder cross courses. 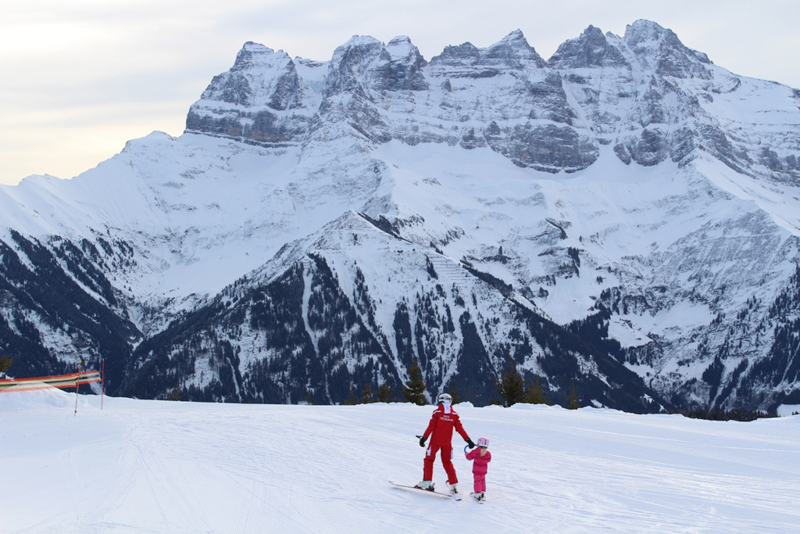 A family day pass in peak season is 55chf per adult and 41 per child, with children under 5 free. 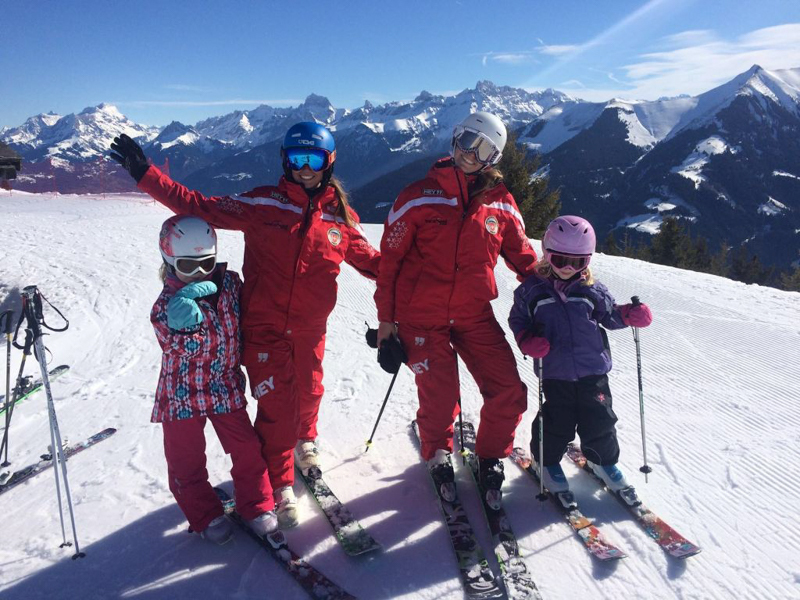 There are several ski schools, but I can only recommend (and would 100% endorse) the great instruction from M3S Ski school, where a child’s lesson for 2 1/4 hr is only 45 CHF…. that’s pretty cheap. For the little ones, there is a “snow garden” in Morgins where beginners can take their first steps. It is is run by the ESS Morgins located near the Morgins Sports Centre. Check out Snowline which is located at the top of town. 6. Anything for non-skiers to do? Sledding/Snow shoeing/Winter Trails? According to their website, there are 80 km of marked snowshoe, walking trails, horse riding, and cross country trails. There are also other activities such as the ski Safari throughout the Portes du Soleil, or a gravity-powered kart that you can take down a mountain! There are many restaurants up the mountain and in the town you will find everything from the super friendly Pizzeria to the local traditional food such as fondue. Morgins is not a party town, though. It is quite sleepy, so if you want more action you can go to Chatel or be happy with the vibrant buzz of the M3 bar at the bottom of the ski lift, Foilleuse in Morgins. and a variety of slopes to suit all types of skiers. Can I say a hip flask? JOKING .. although, don’t you just need it at times? Seriously though I would not be without my SPF sunblock and chapstick. I am a kiwi girl, married to a Scottish guy… with 2 rather awesome kids ( I can say that because I am their mum!!) . We live in Hünenberg See and we love calling Switzerland home. I operate and run bodylogik PILATES in Hünenberg See. We have classes from classical, contemporary, kids, Mens, Roller & Release and most popular is the CardioPilates classes. I also teach privately and duo’s at your request in your home or in the studio. In my spare time, I love to run, cycle, ski and travel. A huge thanks to Sharon for taking us on a trip down to the French part of Switzerland!